Canadian researchers have developed the first test for exposure to nanoparticles — new chemical technology found in a huge range of consumer products — that could potentially be used on humans. 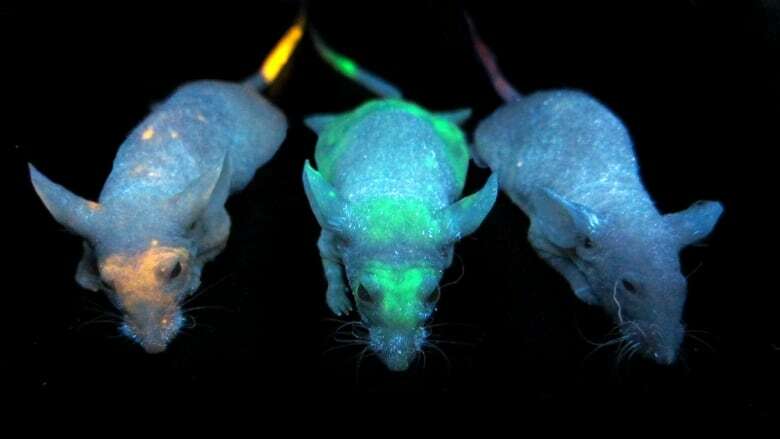 Warren Chan, a University of Toronto chemistry professor, and his team developed the skin test after noticing that some mice changed colour and others became fluorescent (that is, they glowed when light of certain colours were shone on them) after being exposed to increasing levels of different kinds of nanoparticles. The mice were being used in research to develop cancer treatments involving nanoparticles. The research by Chan and his team is in a recent issue of the journal Nature Communications. Nanoparticles are particles with diameters about 1,000 times smaller than the width of a human hair. They are widely found in products ranging from sunscreen to consumer electronics. There is some evidence that certain types and levels of exposure may be harmful to human health. But until now, it has been hard to link exposure to health effects, partly due to the challenge of measuring exposure. "There's no way to determine how much nanoparticles you've been exposed to," said Chan in an interview with CBCNews.ca. There was one way to measure nanoparticle exposure in mice — but it required the animals to be dead. At that point, they would be cut open and tests could be run on organs such as the liver and spleen where nanoparticles accumulate. The new test would likely be viewed as a big improvement by the rodents in Chan's lab. It simply involves shining a light on the skin and looking for colour changes or fluorescence, depending on the type of nanoparticle. For higher precision, it's possible to cut a small sample of skin — leaving the mice alive and healthy — and run it through a machine called an inductively coupled plasma mass spectrometer that has been used for various kinds of chemical analysis decades, Chan said. "That will tell you how much you have in your skin and type of nanotechnology that is accumulating in your body," he added. The researchers found that the nanoparticle levels in the skin were proportional to those in other organs and to the dose the animals were given. "Once you've been exposed to a certain level, you will see it first in the skin," Chan said. "So your skin will be a reflection of your exposure." The test may help researchers trying to figure out what happens to nanoparticles in the body after a person is exposed. So far, Chan said, scientists are still trying to figure out if nanoparticles are toxic once they get inside the body. And no one knows what levels of nanoparticles humans are being exposed to. Despite that, the Nanotechnology Consumer Products Inventory compiled by the Washington-based Wilson Center now contains more than 1,600 consumer products around the world, from sunscreen to electronics. That's because nanoparticles' small size give them a lot of special and useful properties. For example, silver nanoparticles kill bacteria, so they've been used in products ranging from self-sanitizing toothbrushes to odour fighting socks. Zinc oxide nanoparticles protect the skin from a wider range of UV light than other substances, so they're used in sunscreen. Experiments on mice and on human lung cells show that nanoparticles can damage the lungs. And earlier this month, a paper published in the American Journal of Industrial Medicine reported for the case of worker who developed a hypersensitivity and symptoms such as skin rashes and nasal congestion after exposure to nickel nanoparticle powder. The mice in Chan's study suffered no obvious ill effects after being injected with gold nanoparticles and nanoparticles called quantum dots that are made from zinc, sulphur, cadmium and selenium at doses high enough to cause noticeable skin changes. However, the researchers noted there could be long-term effects, and other kinds of nanoparticles might have different effects. They recommend further work to determine how skin test results are affected by exposure to different kinds of nanoparticles and other routes of exposure besides injection.